Tumuga Game Ranches offer accommodation to local tourists during the summer months of September to April. The climate is hot and dry with moderate rainfall. It normally only rains for a short period of time and clears up after a few hours, Changes in weather conditions could always occur. Our reserves are situated in a very low risk malaria area. Insect repellent against mosquitos and other bugs, such as ticks, is advised during the summer months, although not problematic. The Mokopane Ranch is situated 15 km outside Mokopane (previously Potgietersrus) and approximately 65 km outside Polokwane (previously Pietersburg). 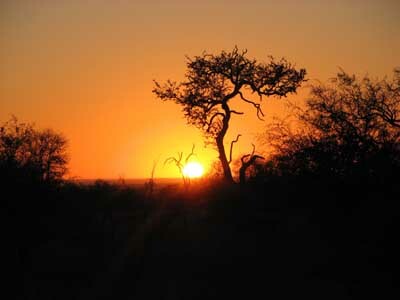 The Limpopo Ranch is situated 110 km north of Lephalale (previously Ellisras) on the Limpopo River. 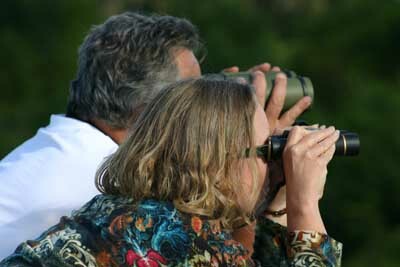 Ensure to bring a pair of binoculors and good camera equipment! If you have a long lens for your camera, it will be of a great use. 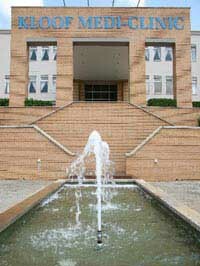 In our area there are two major hospital groups: MediClinic and Netcare. 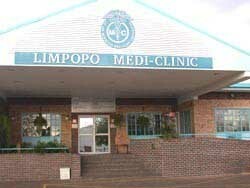 The Limpopo MediClinic is a 50 minute drive from Mokopane Ranch and just over 2 hours drive from Limpopo Ranch. Most hospitals in Gauteng are a 2 - 3 hour drive from the Mokopane Ranch, which includes a choice of 39 private hospitals from the above Hospital groups. Ambulance as well as emergeny helicoper pick up services are available countrywide. Good qualified General Practitioners are available in all towns. From Mokopane Ranch, the closest GP is within 15 minutes drive, and 25 minutes from Limpopo Ranch. Above: Limpopo Medi Clinic in Polokwane. Our Limpopo Ranch is situated in a low risk malaria area. However, in almost 30 years, we never had a report of malaria obtained on one of our ranches. We do have some mosquitos during our summer months from September to April, although not problematic. If you do decide to take malaria prophylaxis, it is essential to take the drugs according to the directions on the package insert. Please consult your physician or a registered health-care professional about the possible side-effects of the drugs. Always advise a health care specialist or travel clinic about updated information regarding malaria risks and when deciding whether to take malaria precaution or not. Below information is for information purposes only as found on the internet at www.sa-venues.com/malaria-risk-areas.htm and must never be used as a set rule! Low Risk Areas: In low risk areas, no anti-malaria drugs are necessary. 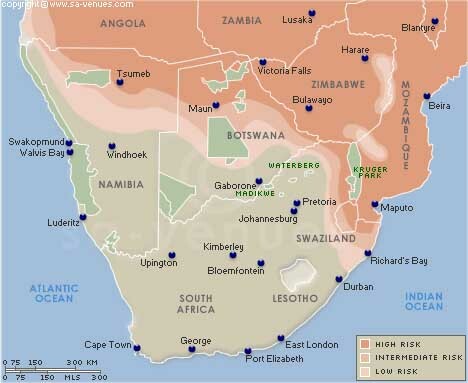 In the North West Province and the Northern Cape, along the Molopo and Orange Rivers, including the Augrabies Falls and the Kgalagadi Transfrontier Park, malaria is only occasionally locally transmitted. It is not necessary to take anti-malaria drugs when visiting these areas, but precautionary measures to prevent mosquito bites should be taken. Intermediate Risk Areas: In intermediate risk areas (Kosi Bay, Sodwana Bay, Mkuze Game Reserve and St Lucia Lake (not the town of St Lucia and the river mouth), the use of anti-malarial drugs is advisable only for high risk people from October to May. Check with your physician or travel clinic. During the summer months of September to May, the use of anti-malaria drugs is recommended in high risk area's such as Kruger National Park, Botswana, Zimbabwe and Mozambique.